On the reverse side of Brother Peter's 25th anniversary of profession of vows holy card yesterday we read, "The Lord is with you." 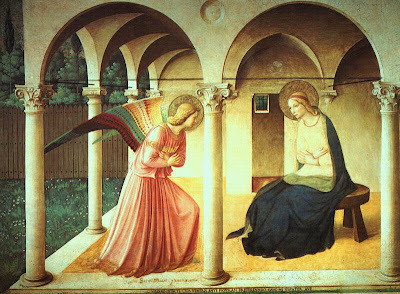 These words are taken from the Annunciation scene from the first chapter of Saint Luke. Brother Peter Heiskell reflected on the call of the Annunciation mirrored his own life. He had the opportunity to say "yes" twenty-five years ago. And has continuously said "yes" on a daily basis in a myriad of ways.